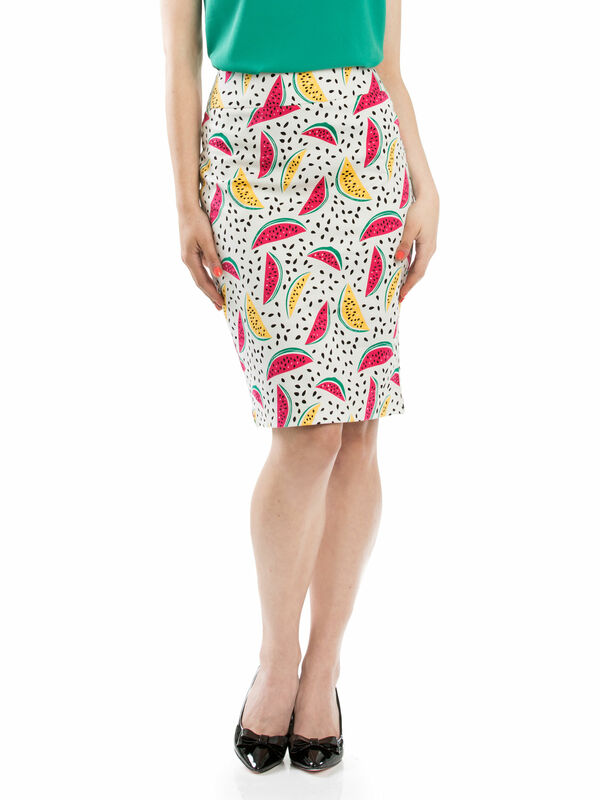 Watermelon Skirt https://www.review-australia.com/au/watermelon-skirt-multi/RE19SK063.RECRM010.html Step into a tutti frutti summer mood with this watermelon print skirt. A fitted style with stretch throughout, it sports a bright vintage watermelon print. The skirt sits high on the waist and has a knee length hem. Pair with a bright silk top and patent heels for a fun work or party outfit. 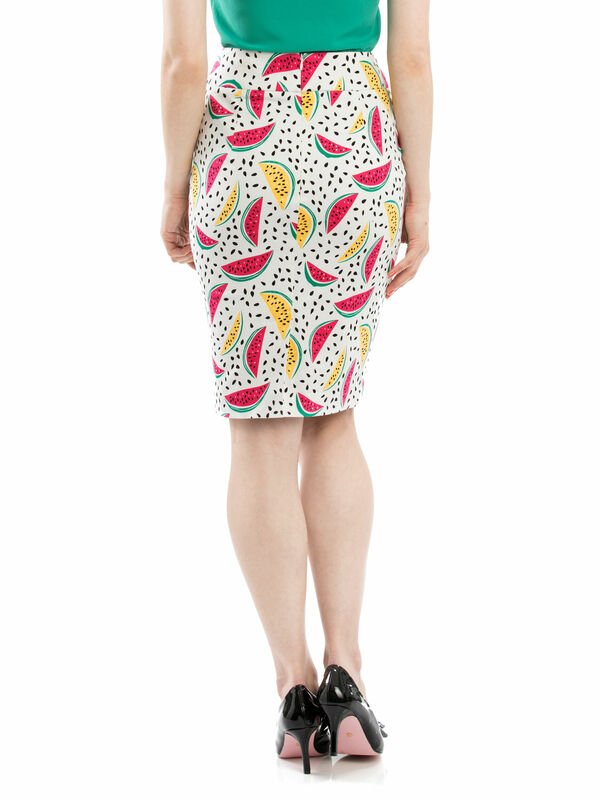 Watermelon Skirt is rated 4.9 out of 5 by 24. Rated 5 out of 5 by Mariet from Quality Plus I bought this skirt recently and am so very impressed. The quality in not only the fabric but the make as well. So weary of buying 'good' brands that fail after a few washes with too little seam width so they simply pull apart. 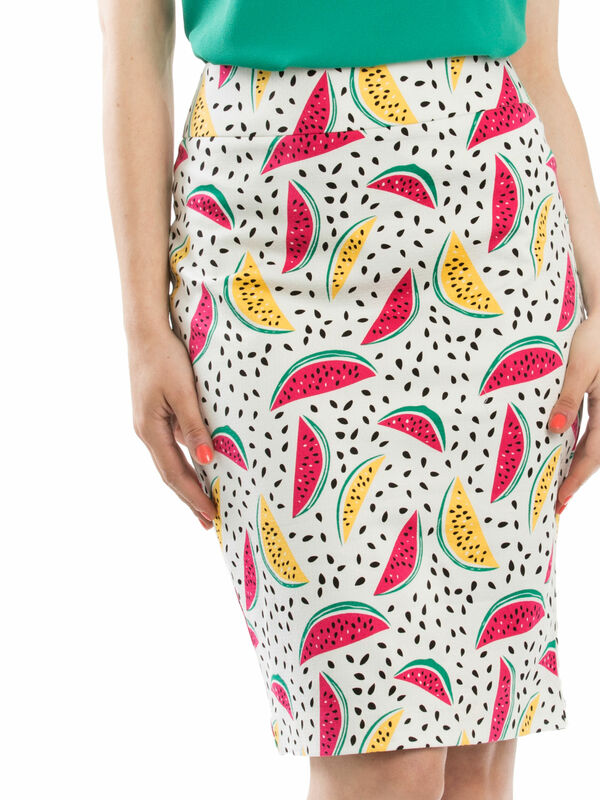 This skirt is smart plus especially with a plain black top to pick up the watermelon seeds! Rated 5 out of 5 by Georgia from Such a bright and colourful work skirt! 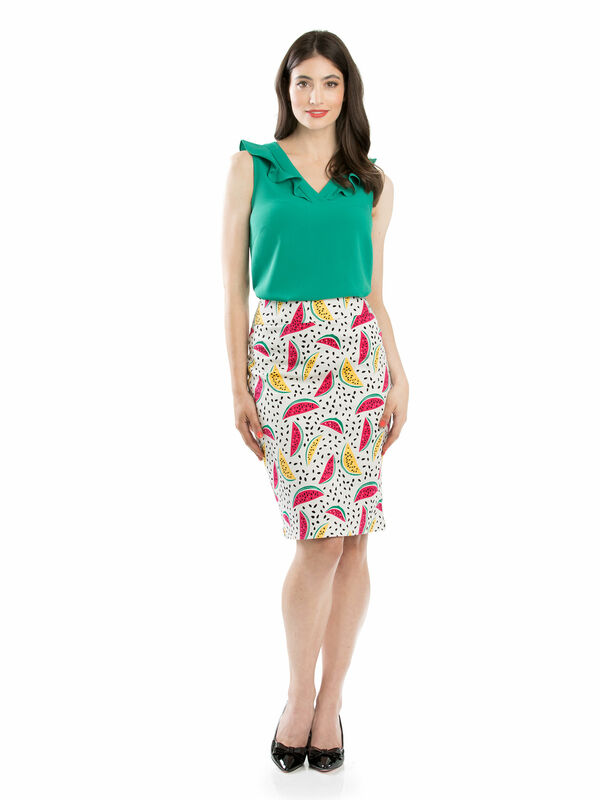 I love that the pencil-style skirt feels like a normal work skirt but the watermelon print and bright colours put a fun spin on such a staple and make everyone smile when they see me wearing it. The cotton lining is an added bonus! Rated 5 out of 5 by Mulli from Comfortable and effortless style I absolutely love this skirt. I only bought it a week ago and have already washed it 3 times just so I can wear it again. I wear it with my Daniela top from Review and it always makes me feel classy without any fuss. Rated 5 out of 5 by LeahO from Great fit and vibrant colours! What could be better than a perfectly fitted classic black and white spotted pencil skirt? One bursting with vibrantly coloured summer watermelons! A favourite to celebrate the season or chase away the winter blues. Rated 5 out of 5 by Emma1992 from Stunning! This skirt is wonderful! It’s better than I could have ever expected! It looks and feels amazing on! It’s such a soft and lovely fabric and it fits wonderfully well due to having just a touch of stretch to it! Rated 5 out of 5 by stephiedp from A summer must! I bought this skirt a few weeks ago and absolutely love it. The colours are amazing and it fits perfectly. People always comment on it. It is the perfect summer warbrobe must! Now I want the playsuit too! Rated 5 out of 5 by anthro from Great quality material, colours and fit. The material is thick and good quality. Skirt is a great fit and sits really well. Very flattering cut and design. True to sizing. Really happy with this purchase!